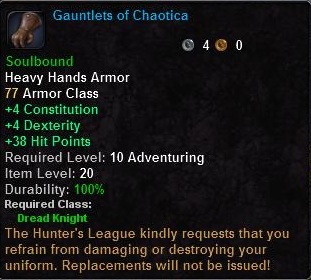 I guess, if we’re going to classify things properly we should say that Part 1 of the Hunter’s League chain consists of the belt and boots, from the two quests in Qa Riverbank; and Part 2 consists of the bracers and gloves, from the two quests in Ksaravi Gultch. I headed over to Skrillen Point, and picked up the next quest in the chain “Moving on Up”(which I mentally sang “To the East Side” immediately following). Immediately I noticed that, while up to this point the Hunter’s League rewards were blue items, the reward for the next quest in the chain was a yellow item. Since yellows cannot be equipped except with either a Subscription or the use of gear unlockers, purchased from the Marketplace, I decided to take a break from the Hunter’s League chain at this point until I level a bit further. Before logging off I claimed my rewards from the marketplace claim items section. As I mentioned when I started this blog, I had bought Vanguard many years back and thus had a snazzy bag I was able to claim. Surprisingly, since Orange items are higher quality than Yellows, my snazzy new bag did not require a gear unlocker or Subscription to use. 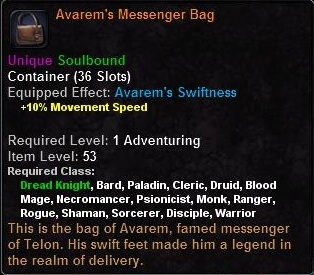 Innate 10% run speed increase? Smexy.